As much as I love writing, and spending time creating blog posts I also love reading posts from other bloggers and dedicate at least an hour a day to reading and commenting on blog posts. Over the year I have read so many great posts by so many different bloggers and so I thought it would be nice to round up a few of my favourites in one place and celebrate what bloggers do best – writing! Last year many children, including LP, started school. In the lead up to September there were so many blog posts about school but my favourites were The Countdown and My August Baby – both of which I could really relate to. Having your first child start school is a huge thing for any parent and both of these posts were so emotional and really lovely to read. I could also relate to Feeding My Baby To Sleep – Reaching Acceptance. Everyone has advice to give when you have a new baby and sometimes you just have to do what’s right for you – no child will breastfeed to sleep forever, no child will have a dummy forever and no child will need to be rocked to sleep forever. I am a firm believer in doing whatever you need to in order to get through the day, week, month or year. With LP and Little Man getting older, and me being quite open about the fact we won’t be having anymore children, I loved reading How Your Last Child Changes Everything. We knew when Little Man came along that he would be our last and so the pregnancy was extra special, each milestone we passed was bittersweet and even now there’s a pang of doing things for the last time. Bloggers often talk about hard hitting subjects. School Children Road Casualties Caused by Parents? was a shocking post that just had to be written but was so hard to read. Anyone that drives for the school run should read this – and anyone else. A really eye opening post about road markings and why they are there. Reading that reminded me of There Was A Boy, a post so beautifully written about road safety and the awful things that can happen. The Faces of Type 1 Diabetes was one of many posts Stevie wrote about her son’s diagnosis and raising awareness of the condition. There are so many misconceptions about Diabetes but I hope posts like this go some way to help people understand what it’s like to not just be a child with Type 1 but a parent of those children too. I also read I Have Breast Cancer – and all the posts that followed – and was so sad and shocked at such a young, healthy woman going through so much – especially as Mim had moved from the UK to Australia just before as well. But Mim’s posts that followed her diagnosis have been uplifting, informative and eye opening and would be a great resource for anyone going through the same thing. There were also a lot of posts about blogging and the wonderful things it brings into people’s lives like How A Cheesecake Broke (and then fixed) the Internet – a post that reduced me to tears – and made me crave a cheesecake like I have never done before! Mummy Bloggers and Feminism in 2015 wrote about this wonderful community that I find myself a part of and Why Bloggers Should Say yes More Often gave a different perspective on those emails bloggers receive day after day. Friendships Old And New spoke about friendships both on and offline and I could definitely relate to growing apart from old friends since the children came along. There were so many posts that looked at the physical side of blogging but also the emotional and close-knit side of blogging – the emotional side, full of friendship and solidarity. A great thing about being a blogger is that you can write about the best of days, you can write about the typical ordinary days and you can write about when you’re Finding It Hard. I love this post because as a blogger it is often hard to say when you are having a hard time and it’s easy to hide behind the smiley photos but more than that I love this post because of the amount of support it generated. The blogging community is pretty amazing. I read a lot of posts about bloggers getting things for free too but the one that stands out in my mind is On Why Nothing Is Free In The Blogging World and I had to agree completely. Blogging is a lot of work – enjoyable work but work all the same! The year was full of pregnancy announcements, birth announcements and birth stories and one that I loved was A Natural Cesarean Section Birth Story. It was refreshing to read a positive story of a cesarean section and I love that this is now in the public domain for other pregnant women to read. Up until Lauren’s post I’d only heard the negatives about cesareans and nothing positive so really enjoyed this. As well as all the pregnancies and births many women, and a lot of close blogging friends of mine, had miscarriages last year too. Why I Feel Differently was a really honest post about how Louise feels about her miscarriage, a couple of years and another child later. The Best Life Changing Worst Thing That Happened speaks about the same thing but ten years later. It’s a completely different thing though when a miscarriage is after a child, when you want to give them a siblings and lose all hope of that. Miscarriage 4 Years On is a really moving post about just that. Three Is Too Many… was a post that made me realise how judgemental society is. How many children is the right number to have? When does it become too many? This is a great post that everyone should read – no matter how many children you have. I couldn’t help but relate to 22 Things I’ve Learnt in my 30’s – and I’m only 31! Some posts are just so real and honest that you can’t help but laugh about how true to life they are. This was one that I was nodding along to. Turn My Frown Upside Down was another that I couldn’t help but agree to, one that shows you can make even the bad days into awesome ones which leads nicely onto I Choose Positivity – something we should all do more often! On Pink and Blue Toys was a great post about gender stereotypes and our longing that toys will one day just be toys. Little Man still plays with a lot of pink toys and none of us really even notice, let alone care! A Year of Fitness at the start of last year inspired me to run and reading it again has inspired me to start running again. Katie’s journey was, is, inspiring and really if she can fit exercise into her day to day life then anyone can and it made me realise that even between shift work and childcare I can fit a half hour run in here and there. If I ever get to my goal weight and level of fitness I’ll have Katie to thank for inspiring me to even attempt to get fit. On that same note, as a Mum, my body has changed so much since having children and Coming To Terms With My Post Natal Body is a post I am sure all mums can relate to at one time or another – my body will never be the one I had before pregnancies. With How Can We Teach Children to Value What They Have I was able to reflect on my own childhood and look at how the children see things, whether they value them and what the most important things are to us as a family. A really lovely post. Any parent of young children – or even a parent of older children – will relate to One Day. Everything is just a phase and before you know it those tiny children will be all grown up. Tomorrow is another that I think every parent can relate to. We will do everything differently, tomorrow. One blog that has had my in tears regularly over the past year – and longer – is The Brick Castle. Jenny’s 16 Months After Losing Elspeth post was not just a Christmas update but it was also reaching out to all those people who regularly feel the way Elspeth did. Those people that just want to leave. I hope that some of those people have read Jenny’s post and realise they are not alone, people will care and people will miss them more than they can ever imagine. There have been times where the media has required a response in blog posts and one of my favourites was 10 Reasons Breastfeeding and Urinating Are Not The Same. This should go unsaid really, shouldn’t it? But no, even in this day and age there are people that need posts like this to set them straight – a really great read! Another post that relates to the media, but shouldn’t really is My Name Is Isis. I loved this post as Isis has so many negative connotations at the moment and yet it is a beautiful name, given to a beautiful girl who I hope grows up in a time when the name Isis can be used purely for her and not the way we have come to know it. And lastly, my favourite post of the year that I wrote. History In The Making Or Just Plain Selfish? is a post I’ve shared a lot recently but one I’m really proud of as it has given me the inspiration to write properly again. 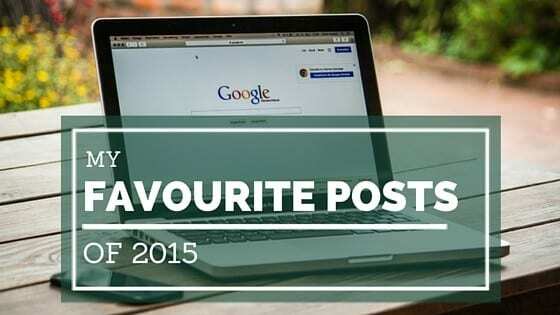 So there we have it, my favourite posts of 2015. I hope it gives you something to read, a new blog to follow or just a new inspiration to write. I’ll be sharing my favourite posts each week in my #LittleLoves post on a Friday and sharing my favourite posts of the year just like this going forward. Lastly, thank you to everyone for writing – about all sorts of things. I, like many other people, love reading blogs and without all of you taking the time to write I would have a lot less to read. Happy New Year everyone. Thanks for including mine Donna, you’ve chosen some brilliant ones and a few of my favourites too. I also love how as always you’re thinking of others by sharing your favourite posts of other peoples and not just of your own. This is a great list I feel this evening might involve wine and reading these blog posts!